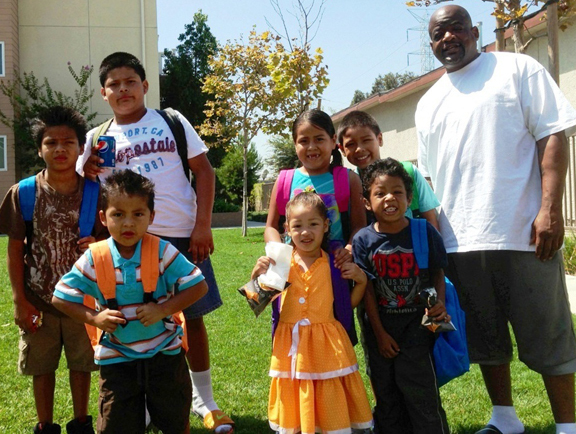 U.S. Bank provided free backpacks and school supplies to 175 children who reside at Dolores McCoy Villa I (“McCoy Plaza”) in Los Angeles’ Watts neighborhood. Bank employee volunteers distributed the backpacks and school supplies to the children during a special event recently. McCoy Plaza is located at 9315 S. Firth Boulevard in Los Angeles’ Watts neighborhood. McCoy Plaza is a low-income housing development, built by Affordable Housing CDC, Inc. (AHCDC), and Watts Community Labor Action Committee (WCLAC). The 64 supportive housing units for large homeless families are fully furnished and offer a range of services, including case management, budget counseling, employment training and placement, academic counseling, access to health care and substance abuse services, and assistance focused on families and independent living skills. The Housing Authority of the City of Los Angeles has committed to provide rental subsidy through its Permanent Supportive Housing Program. WLCAC and its development arm, GWDC, is the original developer of McCoy Plaza and a local experienced developer with hundreds of affordable units built in the Watts community. Additionally, WLCAC human services division provides social services to 30,000 residents per year including the developments it has been involved with. AHCDC developments are known for their quality tenant services and providing much needed housing in under served areas. U.S. Bank provided a $10 million construction loan for the construction of the housing units at McCoy Plaza. This is the bank’s first loan for WCLAC. U.S. Bank has financed three affordable housing projects with AHCDC, totaling more than $25 million in loans. "WLCAC is proud to continue its tradition of 48 years of local affordable housing development with this project and more to come,” said Timothy Watkins, president and chief executive officer for WCLAC.